I met Ryan through my brother-in-law. He’s actually his brother! I’m so glad we were able to set up this shoot. His family are some of the friendliest and most hilarious people you will ever meet. If I could pick a second set of in-laws, it would be these guys, hands down. His parents and sister were there for the session as well, and I thought it was fun that they came. I can get genuine smiles out of people, but it’s a lot faster and easier when the family is there making faces and jokes. 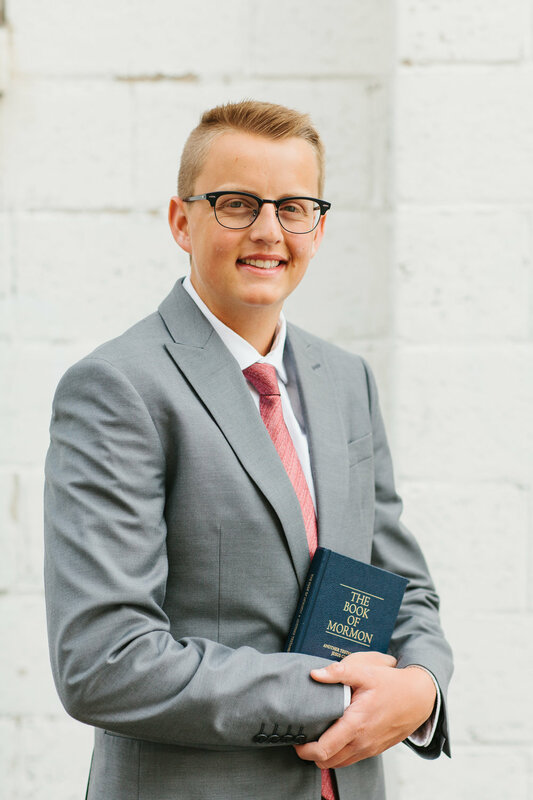 Ryan had his mission papers all turned it and was about to graduate high school, so we needed to get some senior pictures done for his announcement and for his upcoming mission! This photo shoot was pre-mission call. Now I know that he’s been called to the Roseville California mission! I’m so excited for him, it will be such an incredible experience. And he’s leaving in the next month or two, it’s sneaking up fast! He seemed to be stoked to go, so I know he’ll have a good time. We discussed a few fun locations, and I’m so glad he picked this one. This area of Lehi has such a cool variety of old buildings and textured walls. So, we had plenty of options for different pictures and styles. I love the vintage feel of this area and it’s one of my favorite locations. The weather was a little cloudy when we showed up to the location. I was getting a little worried about rain, but we turned out just fine! (Though I’m secretly hoping for a rainstorm toward the end of an engagement shoot because how romantic would that be?!) We got the cool clouds in the blue sky for some of the shots, but it wasn’t too sunny, you know? I’ve known Jessica’s family for years. We all used to live in the same ward in Alpine. I was so glad when she reached out to me to get her senior photos done! It’s always fun to work with returning clients again, especially such kind, beautiful people like these. I remember being so nervous for this shoot because it was my first one since finding out I was pregnant! It was probably one of those fear of the unknown kind of situations. But I ended up making a mountain out of a mole hill, because it was smooth sailing for the whole session. That probably would’ve been a different story if I was in the end of the third trimester. That’s a whole different ball game. We decided to keep it simple and stay in our gorgeous city of Alpine. We went to some old buildings for some fun texture and captured some of the pretty summer greenery. The weather was absolutely perfect. It was warm, but not so much that you get all sweaty from walking around. And the sun was getting low enough in the sky that we had that perfect golden lighting. Can we talk about how gorgeous she is?! It always makes a shoot so fun when you’re basically working with a model! I have red hair too, and I always wished I had the red hair/green eyes combo. Green eyes have always been so dang pretty to me! I love how her outfit was the perfect mix of summery, dressy, casual, and neutral. I’ve always kind of avoided white personally because I thought it would wash me out with my pale skin. But after seeing Jessica in her cute outfit, I’ve definitely changed my mind. I need a cute white shirt like this and some high waisted jeans!